This week in Language Arts we learned about the Letter Buddy Active A . We practiced writing the letter in our phonics workbooks, on paper, and in our Letter Buddy journals! We listened to the A song on Abc mouse. com! The song helped us to think about lots of Active A words. We looked around the classroom for A's! We also colored, cut, and sorted A's. We had so much fun making delicious Apple sauce with our Pre K friends! It smelled so good all day! We had a great time learning the correct way to write an A. Have us show you at home! We did a book study on the book Secret Pizza Party! We made our own chefs complete with a chef hat and a plate for our favorite kind of pizza! In Math, we worked on recognizing numbers. We matched number cards and used our center pieces to help us to practice our one to one correspondence! used flash cards to practice and used bingo stampers to finish Spot it and Dot it. We colored, cut and counted how many slices of pizza we could eat for our Secret Pizza Party Board! We also talked about our favorite toppings for pizza and graphed the results on a poster board! We learned all about animals this week, We explored in the animal center! We read many books about animals and animal behavior such as Animals Should Definitely Not Wear Clothes, Hide and Sheep and The Very Noisy Farm! We talked about where animals live and what they eat! The Goshen Fire Company came to teach us more about Fire Safety. They brought firefighters who showed us how that put on their fire gear. They also brought a ladder truck, a fire truck, and an ambulance to show us. 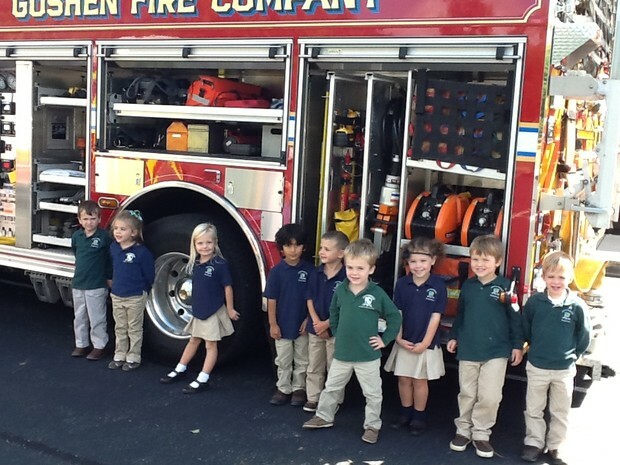 We were able to have many questions answered and we were able to see some of the firetruck equipment first hand. A huge "thank you" goes out to all the men and women that serve our towns and help protect us from harm! We will be introducing a very furry new Letter Buddy! We will learn how to write the letter, recognize it's two sounds, and brainstorm words that begin with that letter. In math, we will work on number recognition and number writing! We will go fishing for letters and numbers and learn about life on the farm! October 9 - Ava Bower will be Principal for a Day! Dress down and wear PINK or the closest color to pink for the boys. October 9 - Pumpkins arrive for our annual Parade of Pumpkins sale! Pick yours up and start carving for the Parade of Pumpkins! October 13- Please join Pre K for a bunch of family fun! We will be reading the SECRET PIZZA PARTY and enjoying yummy pizza! October 14 - Parent Seminar: How to Raise a Motivated Child, presented by PCI Certified Parent Coaches. 6:30pm. RSVP to Lauren Vitelli at lauren.vitelli@nlcinc.com. Pizza and child care will be provided. October 16 - Parade of Pumpkins - Third grade will present the 12th annual Parade of Pumpkins, a spook-tacular display of Jack-O-Lanterns. All proceeds from pumpkin sales and the event will go to Bringing Hope Home. October 18 - 23 - Mr. Rodia will be attending the Annual Principal's Conference. October 23 - Spirit Day - 5th Grade's choice. October 25 - PAC needs your help! Please email cbapacpresident@gmail.com if you are available to help decorate for our annual Halloween Parade and Party. Thank you in advance! Please Join Us Tuesday, October 13th At 5:30 for our first Pre K Story Night! We will be reading the story Secret Pizza Party and enjoying some yummy Pizza. Please RSVP to Mrs.Scallan and Mr. Alaxson with how many people will be attending!